We will be involved in this workshop June 10–14, 2014. Together with Superpool, we are part of the team working on Istanbul. Come along to join us! 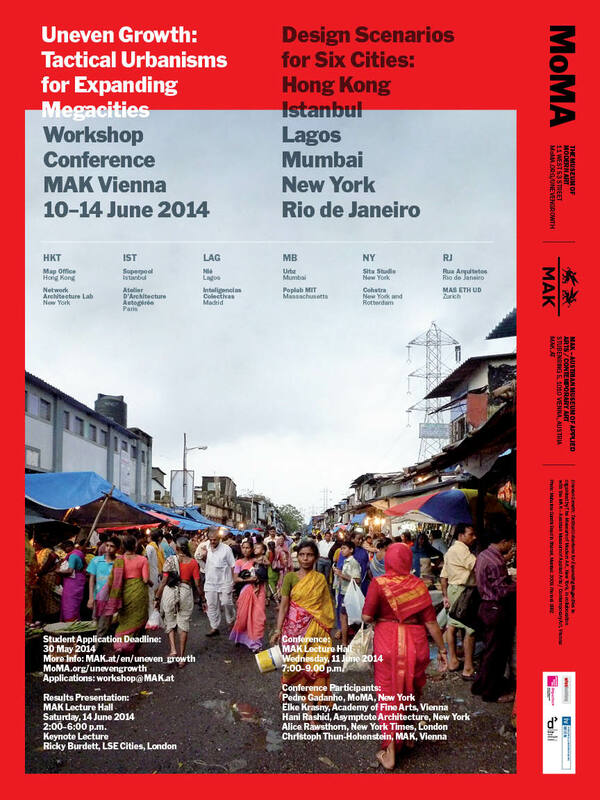 Interested architects, as well as architecture and urban design students, are invited to apply to a weeklong workshop at the Museum of Applied Arts (MAK), Vienna for the exhibition Uneven Growth: Tactical Urbanisms for Expanding Megacities. Participants will assist the six exhibition teams in preparing the final design content for the exhibition’s urban case studies—Hong Kong, Istanbul, Lagos, Mumbai, New York, Rio de Janeiro. The workshop will be held June 10–14, 2014. A final presentation and conference, with international respondents including Ricky Burdett, Alice Rawsthorn, Elke Krasny, and Hani Rashid will be held June 14, 2014. Participants are responsible for providing their own housing and travel in relation to the workshop. Accepted participants will be notified by email.